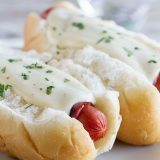 Cordon bleu doesn’t have to mean fancy – these Cordon Bleu dogs have hot dogs wrapped in ham and then topped with a creamy Dijon cheese sauce. Melt the butter in a medium sized pan or skillet over medium heat. Add the flour and whisk in for a minute or two. Whisk in the mustard. Slowly pour in the milk, whisking constantly to avoid lumps. Continue to cook and whisk until the mixture starts to bubble and thicken. Stir in the cheese until melted. Taste and season with pepper and salt, if desired. Meanwhile, heat an outdoor grill or indoor grill pan over medium heat. Wrap one slice of ham around each hot dog and place on the grill. Grill until heated through. Place a hot dog in each bun and then top with some of the cheese sauce. Serve immediately.